This exciting and extraordinary piece of aerial theatre tells a powerful tale of ecological crisis. Combining dramatic film and visuals with breath-taking aerial performance, As The World Tipped confronts one of the most pressing issues for the planet with spectacle, humour and emotion. At the Secretariat of the Copenhagen Climate Change conference, harassed staff fail to notice as the world around them, literally and metaphorically, slides toward disaster. 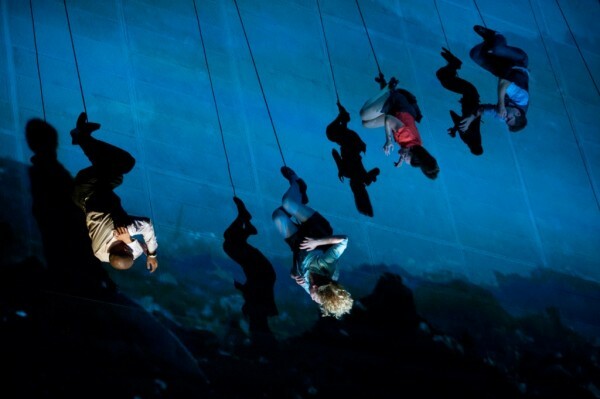 Suspended above the audience in the night sky, the performers struggle to control their increasingly precarious world as they do battle with the effects of drastic environmental catastrophe.